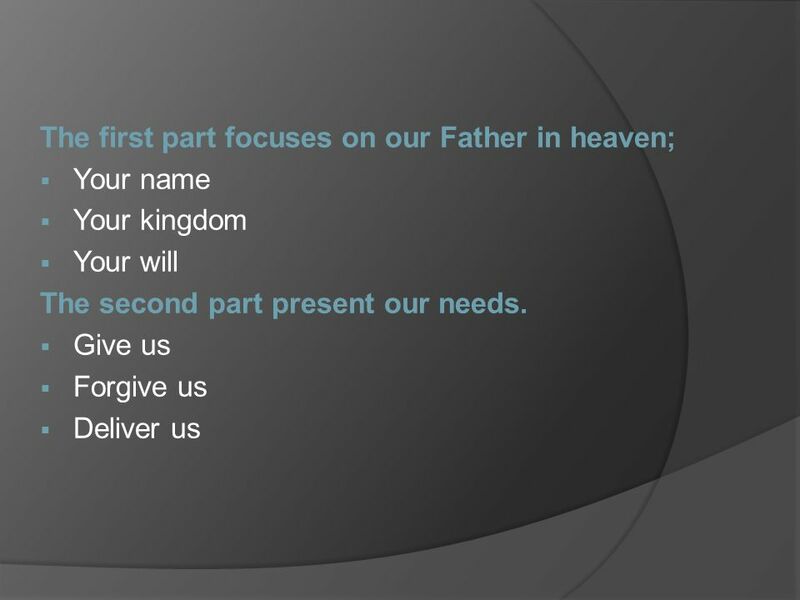 5 Application: Model Prayer 1. Our– If I'm going to follow Jesus' model, I can't say "our" and live my life as if I'm the only person who matters. A follower of Jesus Christ needs the church. It connects him or her to a family. I'm part of the family of God. I cannot exist and grow as a Christian without fellowship, or meaningful contact, or learning, or serving with other Christians. Christianity doesn't work that way. 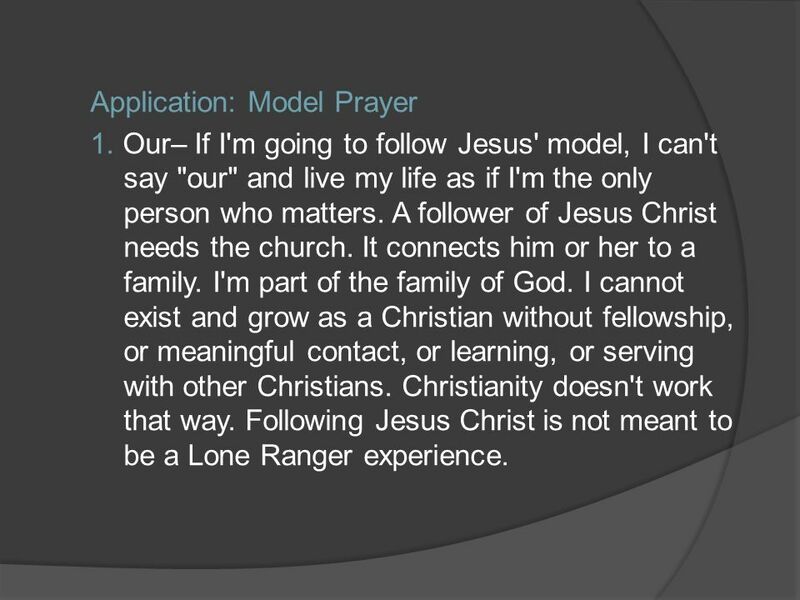 Following Jesus Christ is not meant to be a Lone Ranger experience. 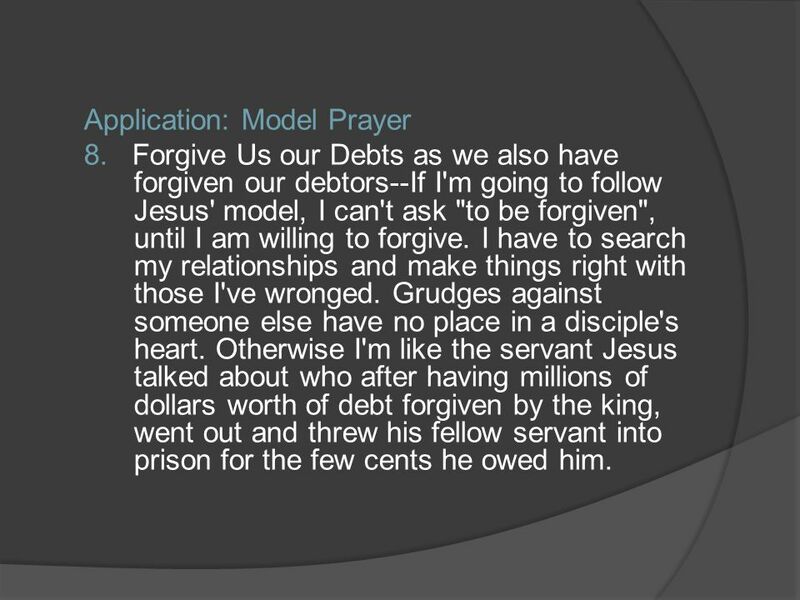 6 Application: Model Prayer 2. Father-- If I'm going to follow Jesus' model, I can't say "Father" if I don't try everyday to live like his child. Children with a parent have rules to follow, expectations to fulfill, lessons to learn. I simply can't call God Father unless I'm willing to live as His child. 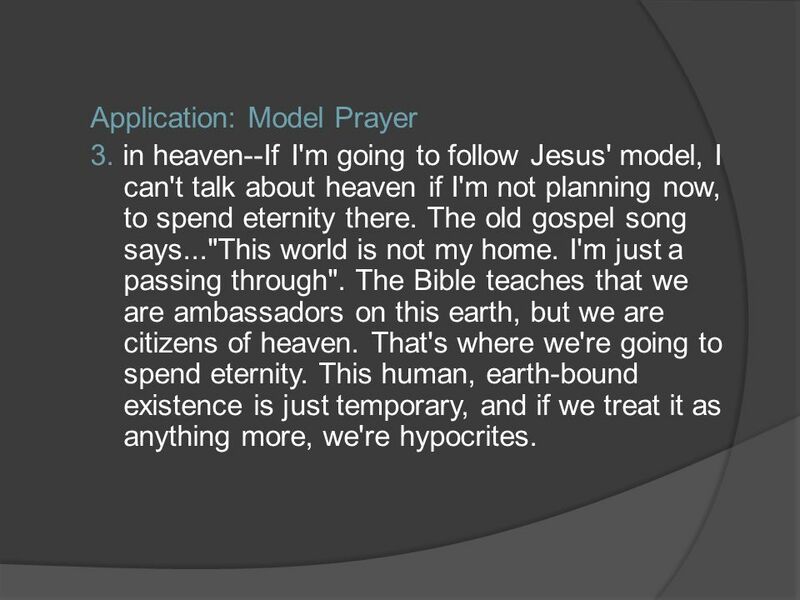 7 Application: Model Prayer 3. in heaven--If I'm going to follow Jesus' model, I can't talk about heaven if I'm not planning now, to spend eternity there. The old gospel song says..."This world is not my home. I'm just a passing through". The Bible teaches that we are ambassadors on this earth, but we are citizens of heaven. That's where we're going to spend eternity. This human, earth-bound existence is just temporary, and if we treat it as anything more, we're hypocrites. 8 Application: Model Prayer 4. Hallowed be your name–Also, if I'm going to follow Jesus' model, I can't say "Hallowed be your name" unless I am in awe of God. And I can't be in awe of God if I treat him like some kind of cosmic errand boy, who simply exists to do my bidding, when and if I need something. I can't talk to Him only when I want something from Him. I have to respect and obey God because He is God, and I'm not! 9 Application: Model Prayer 5. Your kingdom come--If I'm going to follow Jesus' model, I can't say "your kingdom come" if I'm caught up in the kingdom culture of a world that would rather deny the existence of God than acknowledge it. Friends, "It's not MY kingdom come--it's THY kingdom come"–In other words, Your way, God--not mine. 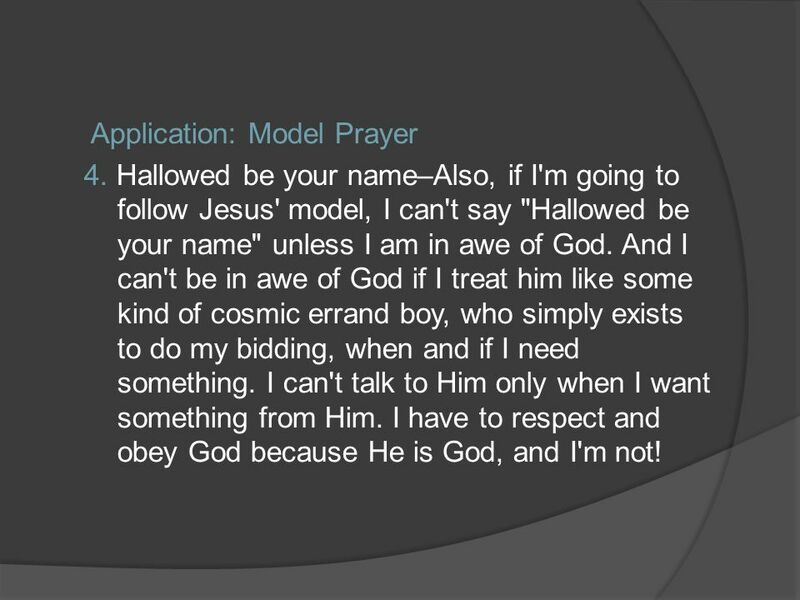 10 Application: Model Prayer 6. 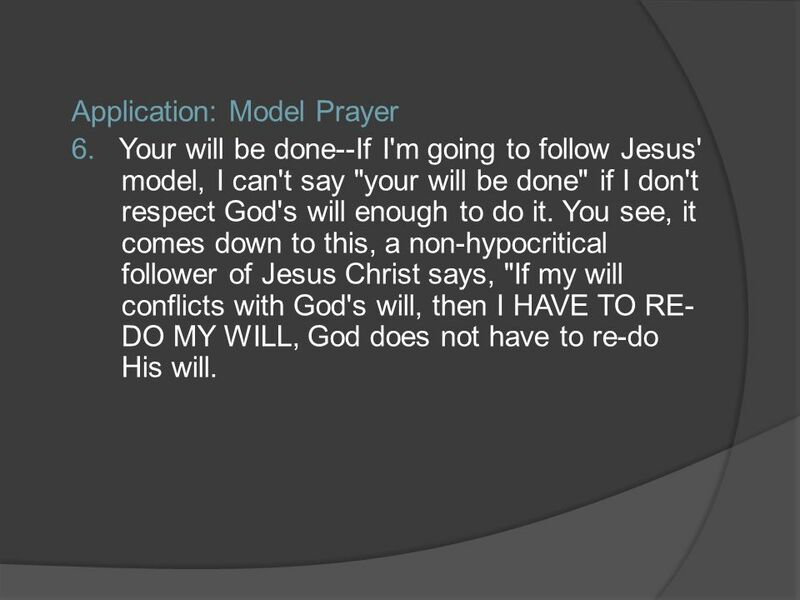 Your will be done--If I'm going to follow Jesus' model, I can't say "your will be done" if I don't respect God's will enough to do it. You see, it comes down to this, a non-hypocritical follower of Jesus Christ says, "If my will conflicts with God's will, then I HAVE TO RE- DO MY WILL, God does not have to re-do His will. 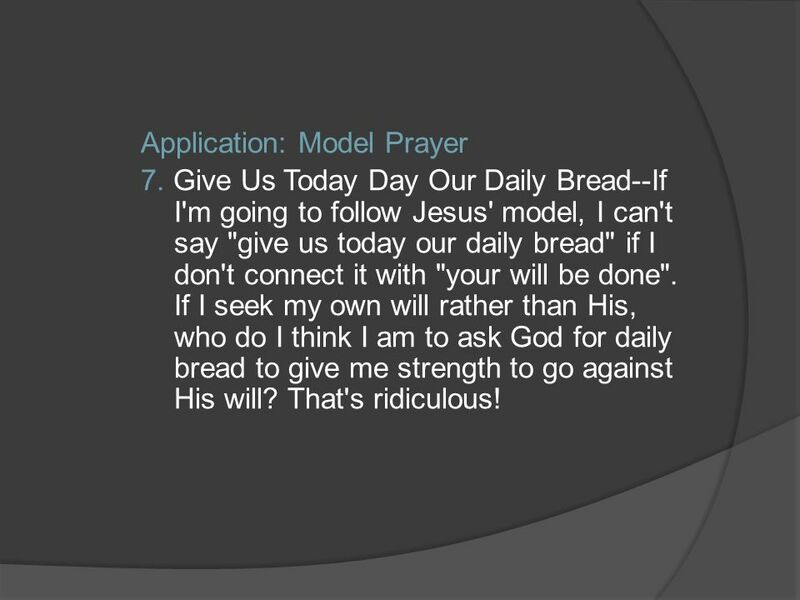 11 Application: Model Prayer 7. Give Us Today Day Our Daily Bread--If I'm going to follow Jesus' model, I can't say "give us today our daily bread" if I don't connect it with "your will be done". If I seek my own will rather than His, who do I think I am to ask God for daily bread to give me strength to go against His will? That's ridiculous! 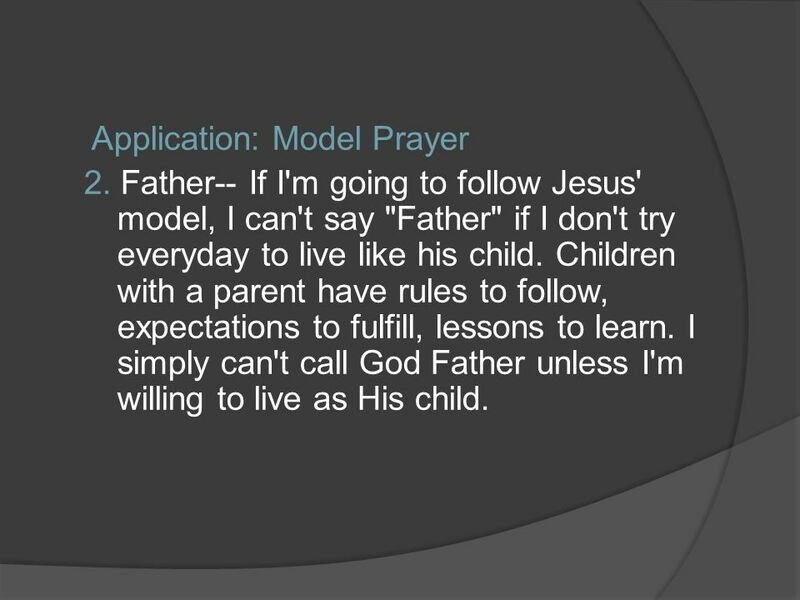 12 Application: Model Prayer 8. Forgive Us our Debts as we also have forgiven our debtors--If I'm going to follow Jesus' model, I can't ask "to be forgiven", until I am willing to forgive. I have to search my relationships and make things right with those I've wronged. Grudges against someone else have no place in a disciple's heart. Otherwise I'm like the servant Jesus talked about who after having millions of dollars worth of debt forgiven by the king, went out and threw his fellow servant into prison for the few cents he owed him. 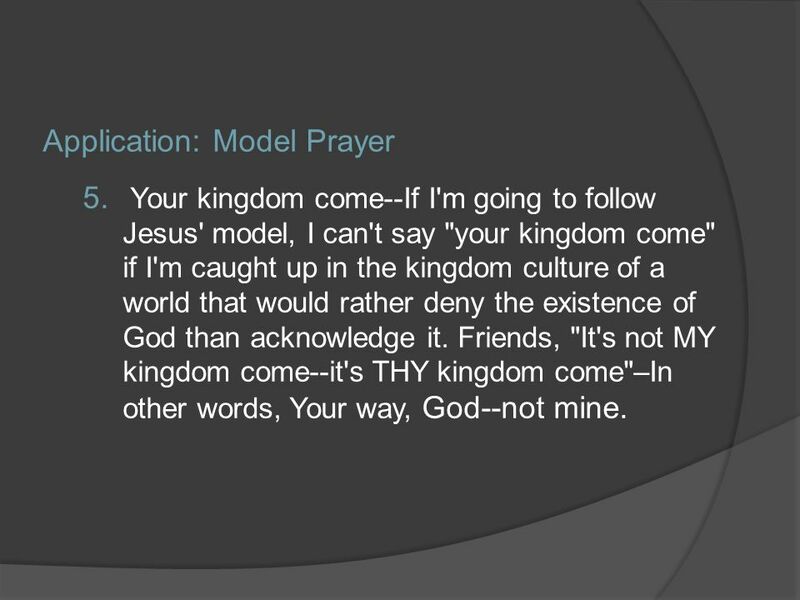 13 Application: Model Prayer For the kingdom, the power, and the glory are yours, now and for ever. Closing words of praise and worship: we acknowledge that only God is God, that only he is all-powerful, only he is full of glory. Everything in heaven and on earth belongs to him. He is the creator; the Alpha and the Omega; the beginning and the end. 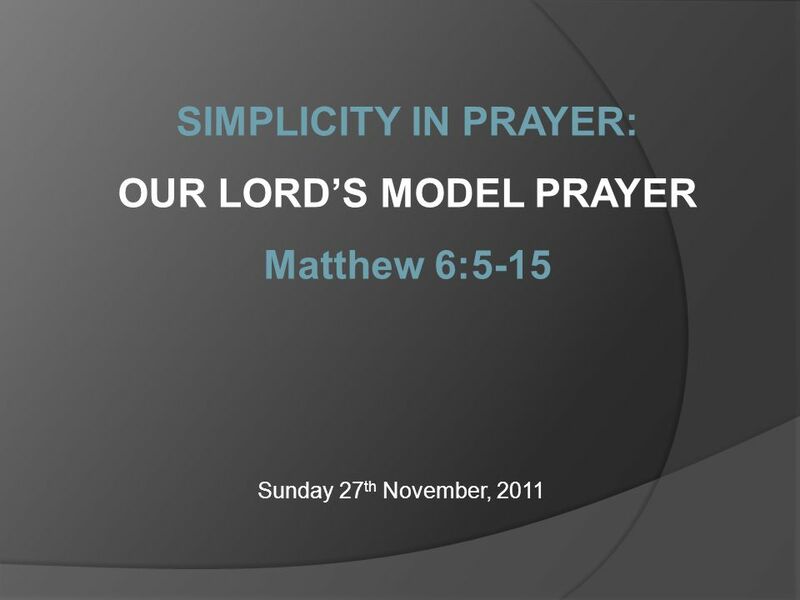 Download ppt "Sunday 27 th November, 2011 SIMPLICITY IN PRAYER: OUR LORD’S MODEL PRAYER Matthew 6:5-15." 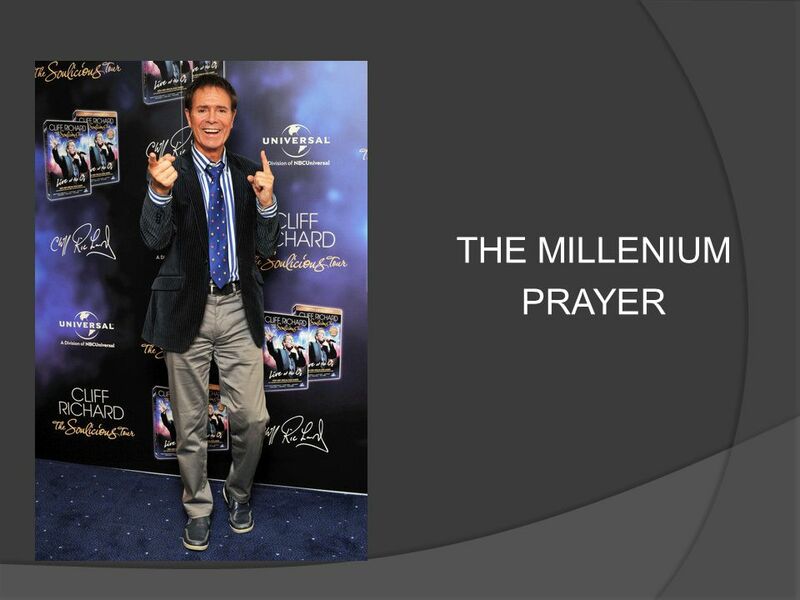 "After this manner therefore pray ye: Our Father which art in heaven, Hallowed be thy name. Thy kingdom come. Thy will be done in earth, as it is in heaven. Never forget, does that mean never forgive? Listen and obey Three in one  Repent!  Be baptized!  Receive the Holy Spirit Because you say so: Luke Scene One – Hearing IS important. Everything. Unpacking Prayer Confession, Repentance Part 8: Confession, Repentance and Forgiveness and Forgiveness. 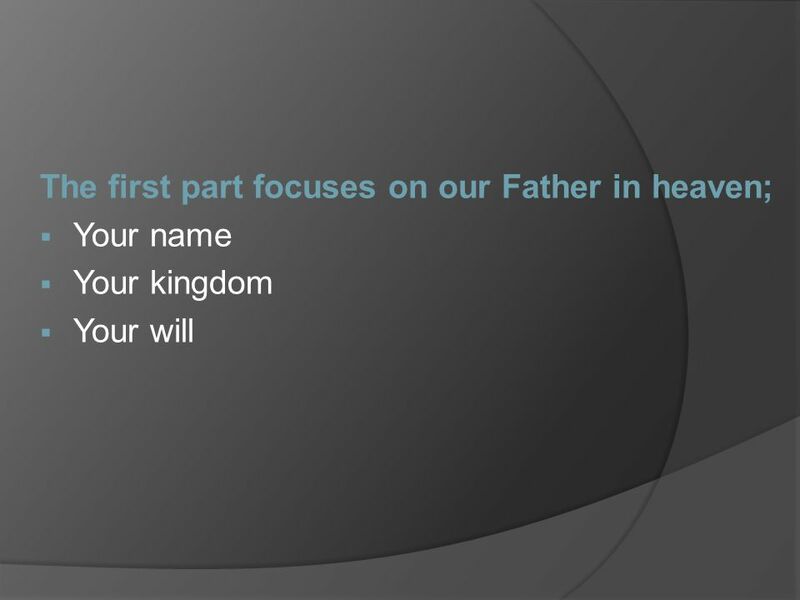 “Upward Direction” 2 Thessalonians 1:11-12 and Matthew 6:9-13. “Pray Like You Mean It” Matthew 6:9-15. “The one concern of the devil is to keep Christians from praying. He fears nothing from prayerless studies, prayerless. A few thoughts on the day... “I cannot think of any need in childhood as strong as the need for a father’s protection - Sigmund Freud. Lesson 59. What are we asking God to do when we pray the Fifth Petition? Recap from Last Session: 1. Our Daily Bread 2. Give Us. PART 3 - WHAT TO PRAY Q. WHAT IS PRAYER? A. Our PERSONAL means of communication with the One who created the world Luke 11:1 One day Jesus was praying.